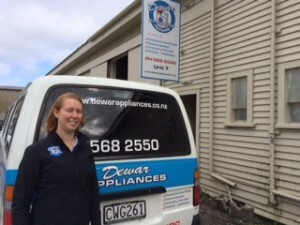 Nerissa has been with the Dewars team for 12 months. She comes with a lot of experience, having worked for Capital Appliances and Haier Appliances in the past. 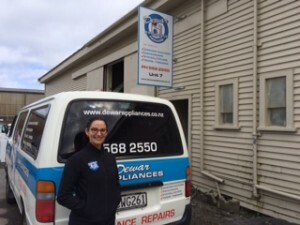 Nerissa sure knows the in and outs of customer service and spare parts. Rhys is the youngest tech on the team and has been trained by Paul and the other technicians over the past 2 1/2 years. Rhys has his national certificate in motor mechanics and is now a qualified Appliance Technician. Rhys offers a high level of customer service. Paul has been in the appliance industry for 22 years. 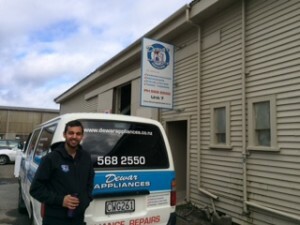 He learned the trade at Independent Appliances, then went on to contracting for Capital Appliances. Paul started Dewar Appliances in 2000 and takes great pride in the company that he and Jo started together. He’s always looking to offer the highest level of customer service. Jo too comes from a background in the Appliance industry and has a strong emphasis on customer service. Jo¹s main role is to oversee the smooth running of the company from technicians to customers to ensure our customers get the best service. James has been in the Appliances industry for 10 years. 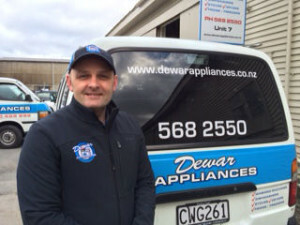 He has been a Technician with Dewar Appliances for the past 4 years. James has a broad range of product and brand knowledge which is an asset to our team and assists with the large range of brands we service. Mel works in the office along side Nerissa taking phone calls and booking requests. Mel is currently employed as Accounts Manager.